Before we usher in the new year and I start talking to you about my "One Little Word" I've chosen for 2015, (see my One Little Word for 2014), and some of my expectations for my life personally, with regards to this blog as well as my business…I have to take a minute…on this very last day of 2014 to share something special with you. and something that touched my heart in a way it's honestly never been touched before. Christmas morning this year unfolded as it does every year with my kids; it is usually pretty simple but with a few fun surprises. I'm big on traditions so the way things usually work around my house is the girls are given one present to unwrap on Christmas Eve. Of course, the present is always the same…a new set of pj's. The last few years, J has decided I need to be included on the the new pj's tradition too so he'll surprise me with a pair of my own. Once the magic reindeer food has been sprinkled onto the lawn, Santa's cookies + milk have been left out, the last good-byes have been given to Stuart, our Elf on the Shelf, and the last of the presents have been wrapped, everyone heads to bed. We all awake on Christmas morning to the sound of excitement and jubilation as one of the kids discovers the bounty of new presents Santa left behind while we slept, as well as stockings now plump with treasures. This year…of course…it was six year old Ella who awakened the household. We sit as a family, wiping sleep from our eyes, our hair disheveled, opening gifts in our new pj's with the sounds of ooo's and ahhh's filling the air - and the occasional shrieks of joy from Ella. I'm sure my older girls would agree they certainly aren't spoiled with gifts like some of their friends and family. BUT...I'd say when the last of the torn gift wrapping, tissue paper, ribbons and bows fall gently to the ground and settle around the Christmas tree…there are still plenty of smiles. Actually, there is no breakfast to eat or prepare on Christmas morning because my mom and step-dad are always anxiously awaiting our arrival at their house for our annual Christmas Brunch + gift exchange. So, our grumbling bellies pull us away from our fixation on the gifts we've just opened at home and we shower, dress and load up the unwrapped Christmas presents left under the tree to head out to see Grandma and Grandpa. Once we arrive, hugs + kisses are exchanged, food preparations are finished and we enjoy casual conversation around the table as we eat together. Once our bellies are full it's present time…again. Grandma and Grandpa have the grandkids start opening gifts first and then they'll finally concede to opening the gifts we've brought for them. The process is usually short and sweet because there are just a few presents to unwrap and then we sit back for awhile to enjoy Christmas morning together before my family and I head back home for the afternoon. That's how it happens every year. Right after we all had opened our gifts at my mom's, I noticed J and my stepdad quickly disappeared from the room. I immediately sensed they were up to something and almost as fast as they had left the room they reappeared carrying an extremely large and oversized wrapped gift…FOR ME!! My mind was going in a million directions trying to figure out what this was all about and then I was even more confused and dumbfounded when I read the gift tag: "For: Jessica Love: Chuck, Robyn, Mom, Rick and J"
What? Why would my aunt and uncle be part of giving me a gift? This was a very unusual scenario. In a state of bewilderment I began unwrapping the surprise gift with slow intention. I was looking for clues as more of the original packaging was exposed and I was also attempting to buy myself more time to solve the mystery before I received anymore clues. The room was quiet and all eyes were on me and I felt strangely nervous. With the wrapping completely removed there was no indication on the bare brown box as to what was inside. My stepdad brought over a knife to help remove the packing tape from the top and within minutes I was staring at a brand new iMac computer. What? Why? I couldn't believe it. I was frozen for a moment as I frantically tried to wrap my mind about what had just happened! I think I remember looking up and although I don't really remember what I said exactly, I just remember feeling an enormous amount of confusion. I could not process why my aunt and uncle had anything to do with such a large purchase. I was overcome with emotion as the play-by-play spilled from my mom's lips. I just cried…and then realized my stepdad was recording everything. Ugh!!! But the tears and the emotion were NOT about receiving an amazing present. The tears were from the realization that two people, two family members, think highly enough of me…and what I do…and what I'm passionate about…to take time to secretly scheme with my mom and J to come together to do something so incredibly sincere and heartfelt…for ME!!?? Knowing that my aunt and uncle put aside their pain and heartache for just a moment, from having recently lost their daughter, Holly, to focus on me? Well…needless to say I was and I am completely humbled. These two people chose to do something above and beyond for someone else despite the pain the holiday season was inevitably ushering in for them. The gift was not about what was in the box. People who actually READ my blog. People who LOVE what I do and what I stand for. People who BELIEVE in me and what I'm about…and what this blog is all about. People who took time essentially to recognize, appreciate and validate what I'm trying to do here on this blog. Well…THAT is the very best gift I could've ever received. It's not what was in the box that overwhelmed me with gratitude. The heartfelt emotion was gratitude for the true Spirit of Christmas that poured over me when I finally understood what was going on, how it came about and the love behind it all. There are no words to adequately describe my appreciation for your kindness and thoughtfulness. And thank you Mom, Rick and J for helping the secret plan to be executed beautifully. This was the very best Christmas ever. Not because of what you gave…but rather because of the pure love behind it! Be safe as you are out there celebrating tonight! 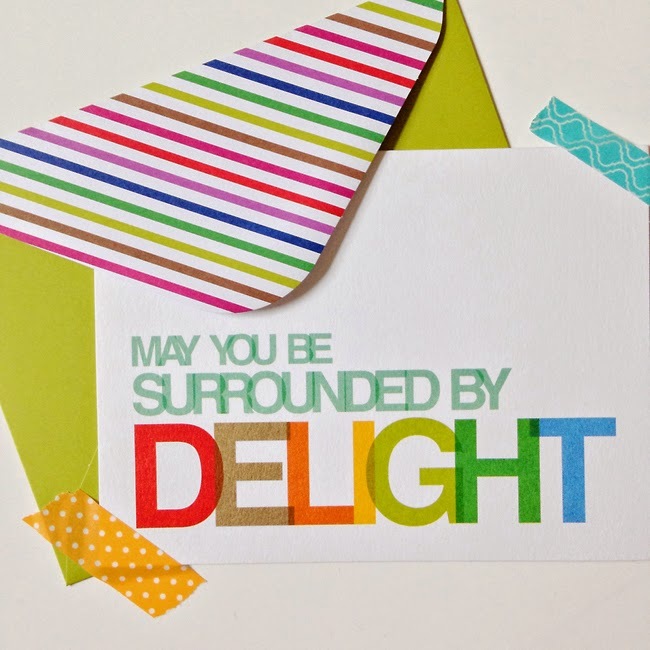 I'll be back tomorrow to share with you my One Little Word for 2015!! 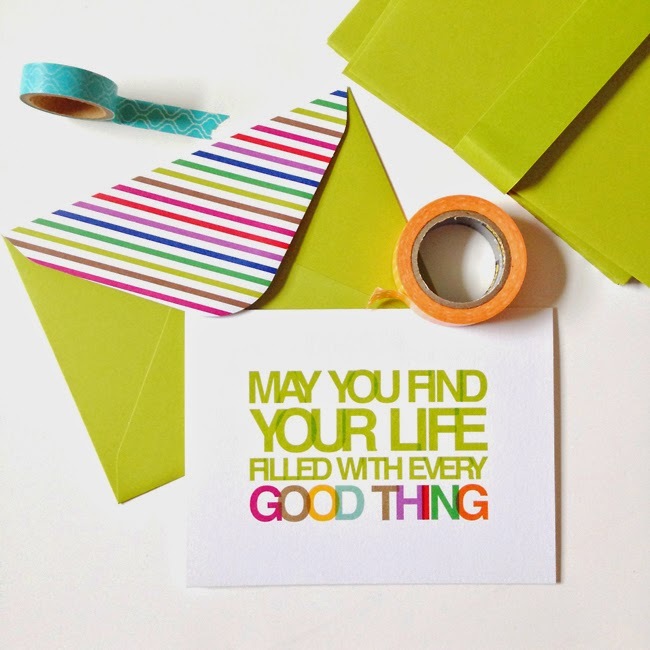 The adorable note cards you see in this post are from my favorite inspirational products company: Compendium Incorporated! 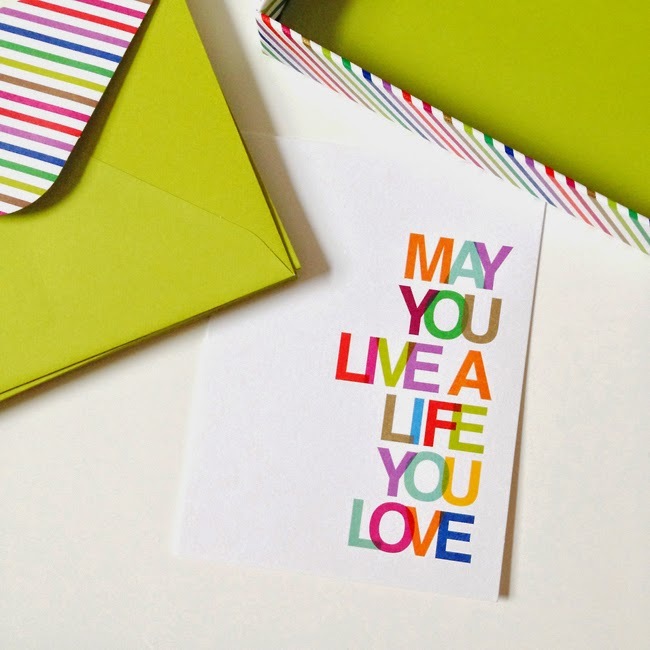 See the full line of Compedium Boxed Note Card Sets on the Live Inspired Website or go directly to the "May You Live a Life You Love" Boxed Note Card Set - which are the ones I photographed for this post. I also have to give props to J for not spoiling the surprise. Two days before Christmas I was having a serious conversation with him about how I would need to be replacing my old iMac computer after the holidays. He never eluded to anything. Mr. Sneaky!! Ella insisted we all gather around the Christmas tree on Christmas Eve night to say a prayer for Stuart to travel safely back to the North Pole. We also had to blow him kisses too. Ella also decided we needed to leave only ONE cookie for Santa and include an apple…she wanted to make sure he'd be eating something sweet AND healthy this year. I just love her! trying to soak in all of the moments I have with my kids + family. I was even going to start my inspirational Instagram posts back up again today - since it's Monday and all. BUT...I quickly decided to just wait until NEXT Monday. I'll get past the New Year's holidays and get the kids back in school and then I'll get back into my blogging routine! That buys me more time to snuggle with my little Ella…listen to my Ema play her new Luna Concert Ukelele…and catch up with my Clara on "life-after-high-school". Ella and I have a list of fun things we'd like to do before she starts school back on Monday. 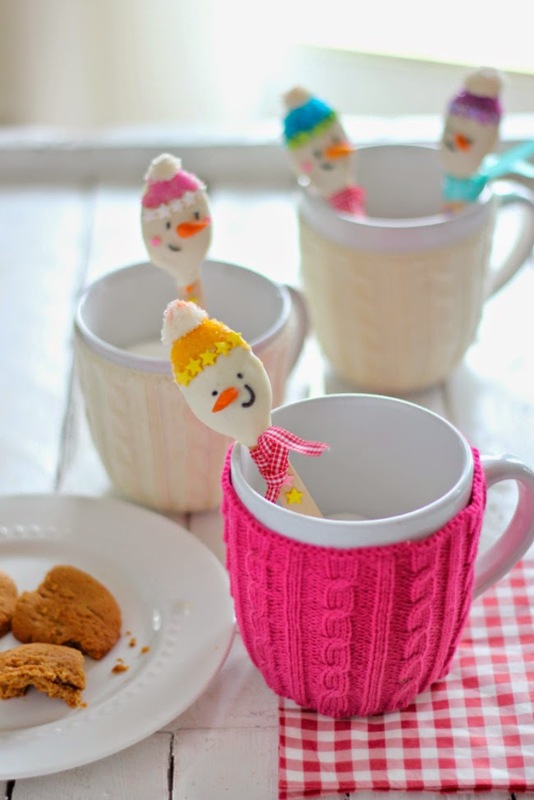 I found these adorable snowman spoons from Joanna Gaines over on the Magnolia Homes Blog. so these cute spoons are definitely going on the list. I thought you might want to make them too. And those mug sweaters!! I'm really crushing on those! If I find out the source, I'll let you know too…just in case you want to know. The last couple of years I've been very ready to take down the holiday decor the very day after Christmas. In years past I would procrastinate taking it down…sometimes leaving it up until almost Valentine's Day! Ha!! This year…I'm somewhere in the middle. I want to take it down to help usher in the New Year...ahead of the game…so I can feel a little more organized with everything already put away before a brand new year of opportunity awaits! BUT…I'm really going to miss the pretty Christmas lights and our tree. I'm betting I'll have it all down and put away right after New Year's Day! 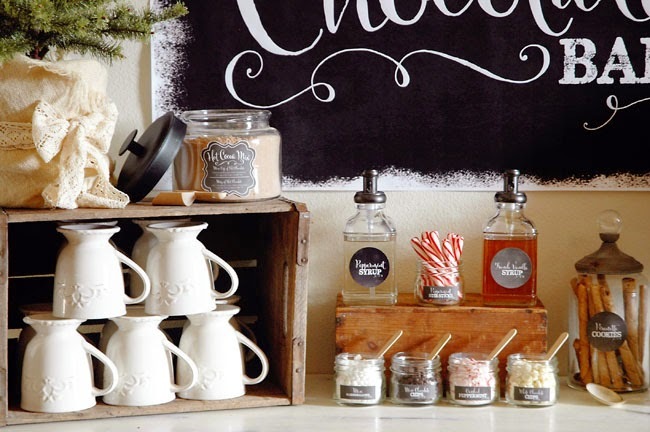 I'm so happy with how our Hot Chocolate Bar turned out this year! 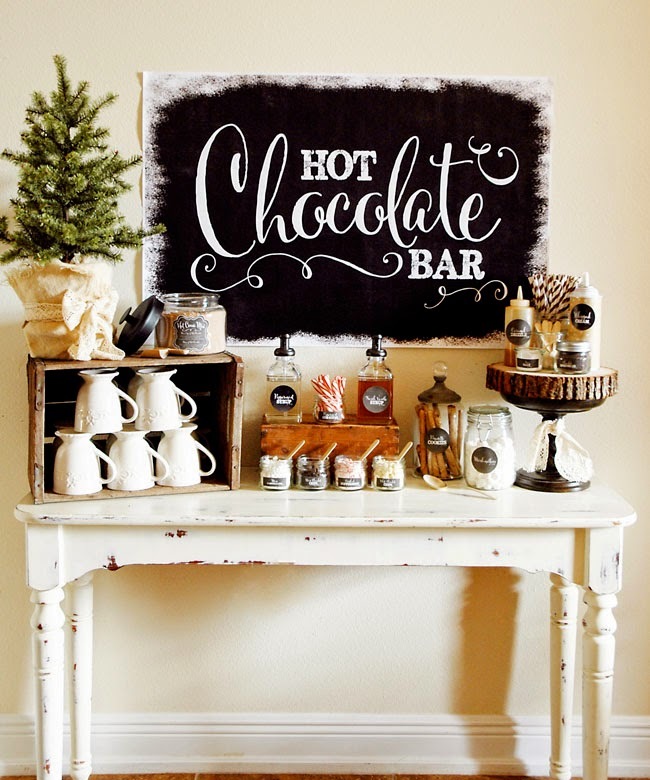 (Check out our previous Hot Cocoa Bar)! I added a couple of new elements that I'm loving and I think you'll love them too! 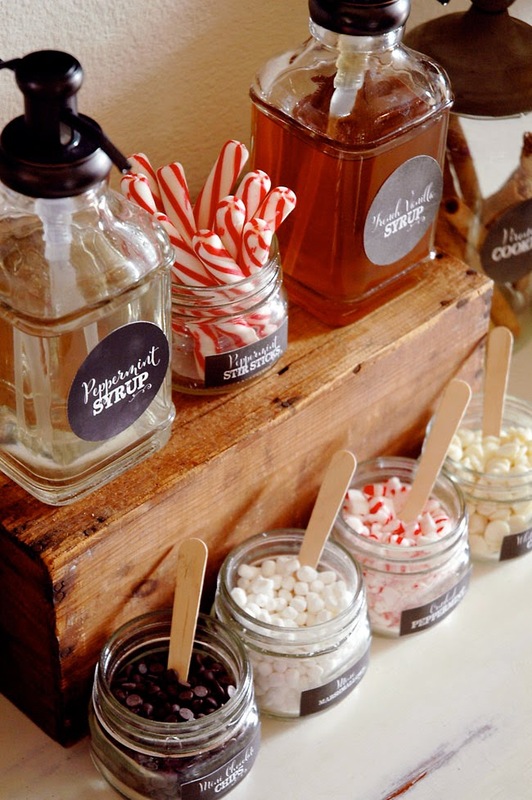 I was inspired to add some fancy flavored syrups this year after a friend/customer recently ordered the Hot Chocolate Bar Collection from me for a wedding she was putting together this past weekend. 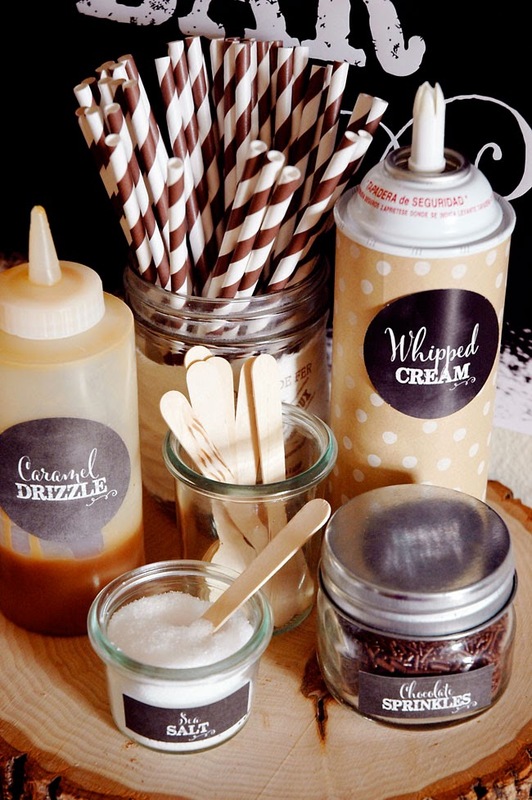 She requested some custom labels…which included some fun flavored syrups...and the obsessing for me began. We stuck to using the same, fabulous homemade Hot Cocoa Mix recipe we've been using for a couple of years now and the 48oz. 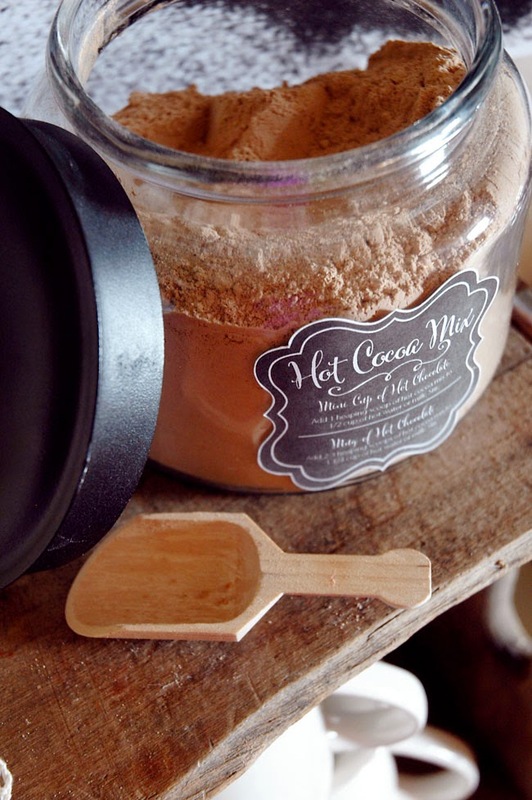 Anchor Hocking Jar holds the entire batch perfectly - with room for the cute mini wooden scoop. 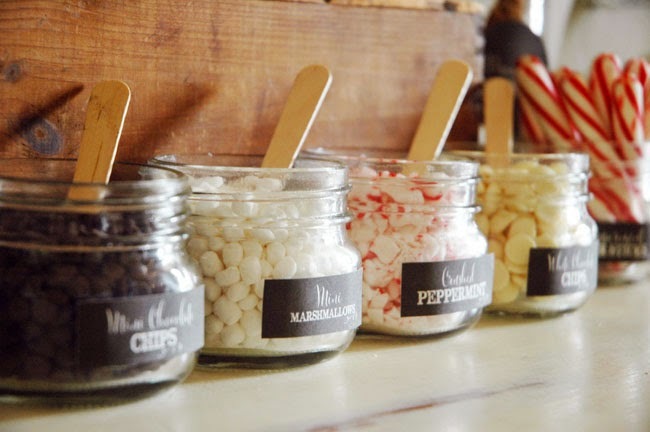 I stuck with the toppings I knew my girls loved: Mini Chocolate Chips, Mini Marshmallows, White Chocolate Chips, Dark Chocolate Vermicelli Sprinkles and "Crushed" Peppermint this year instead of the whole peppermints I've used in the past. (just crush up some starlite mints using a rolling pin). 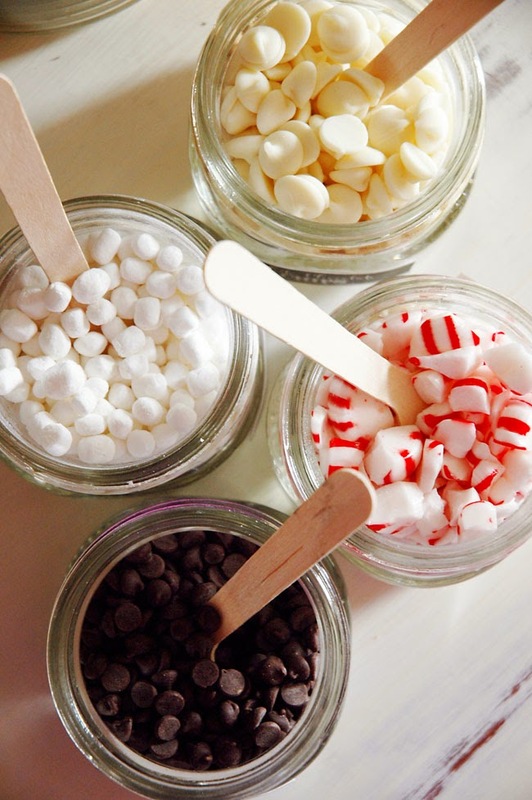 I also opted to have Peppermint Stir Sticks on hand to be used as stirrers - besides, they are a fun way to add a pop of peppermint to your mug of hot cocoa! So let's talk about what's NEW: Flavored Syrups! These are the same types of syrups added to your fancy Starbucks coffees! These are SO simple to make and inexpensive to purchase. Peppermint syrup - homemade using 1 cup of water, 1 cup of sugar + 1 tsp. Peppermint extract - so easy! 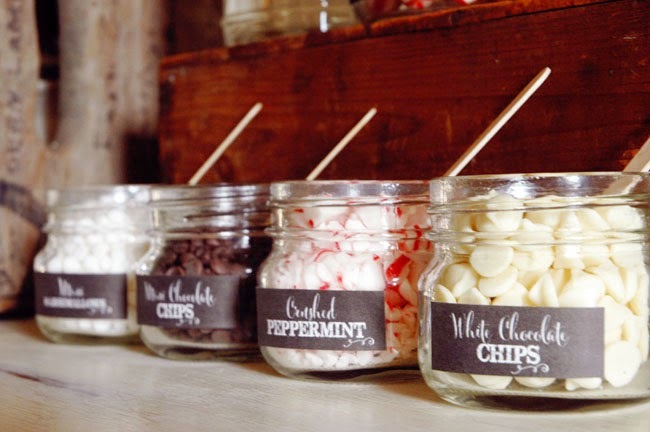 You could even use a candycane or peppermint hard candy in place of the Peppermint extract but I didn't want my syrup to be red - you can choose to do that if you want to!! 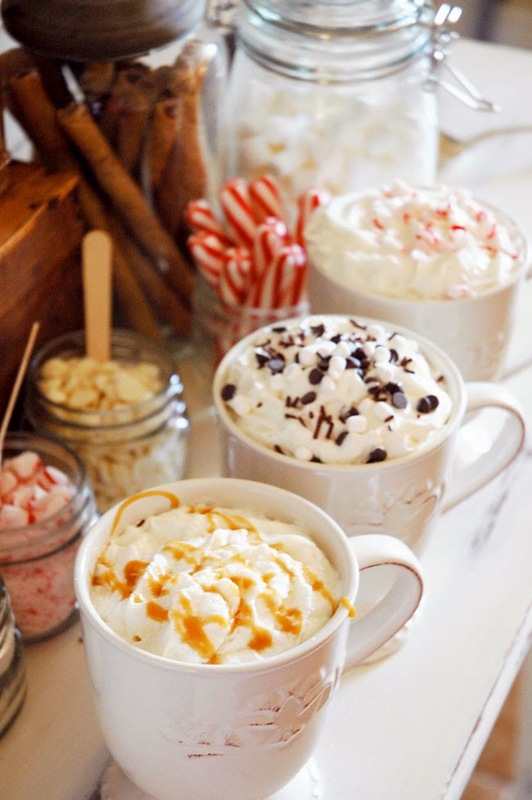 I LOVE that you can add a few pumps of the syrup to change up the flavor of your hot cocoa!! (I think I've had to add about 5 pumps to mine but my mugs are pretty big). The syrup dispensers are actually SOAP dispensers I picked up from Kirkland's a few month's back. They work GREAT!! I did see some at Target this week that look almost EXACTLY like the ones shown here - a little more narrow but the same bronze finish on the dispensers. Fun, right? 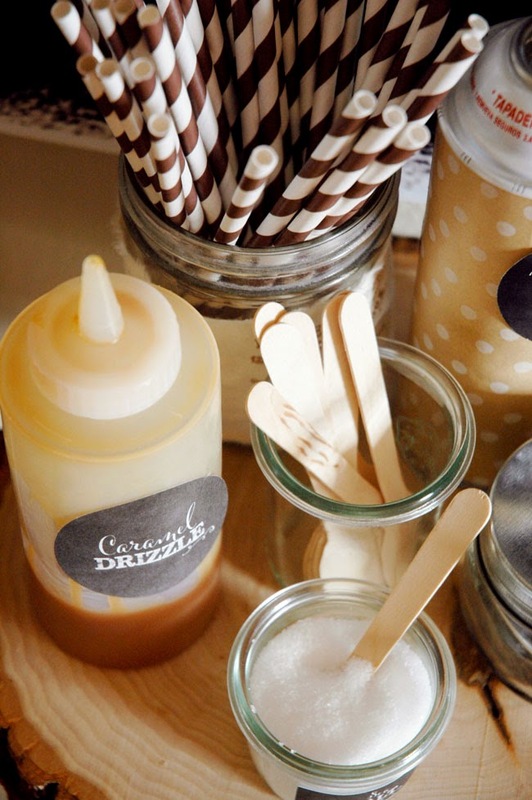 The other NEW elements I added this year is a bottle of Caramel Drizzle + a small tub of Sea Salt. You know where I'm going with this!! 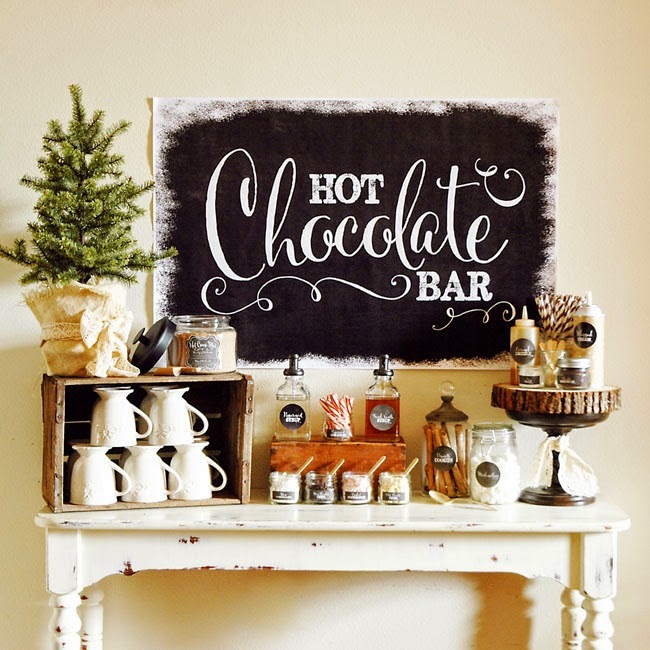 I LOVE the salty + sweet combo so I had to take advantage of the opportunity to include it as an option for the Hot Chocolate Bar. So with the new syrups along with the caramel and sea salt, I've come up with THREE FLAVOR FAVORITES!! Mix up a mug of Hot Chocolate. Add 3-5 pumps of French Vanilla Syrup. Top with marshmallows. 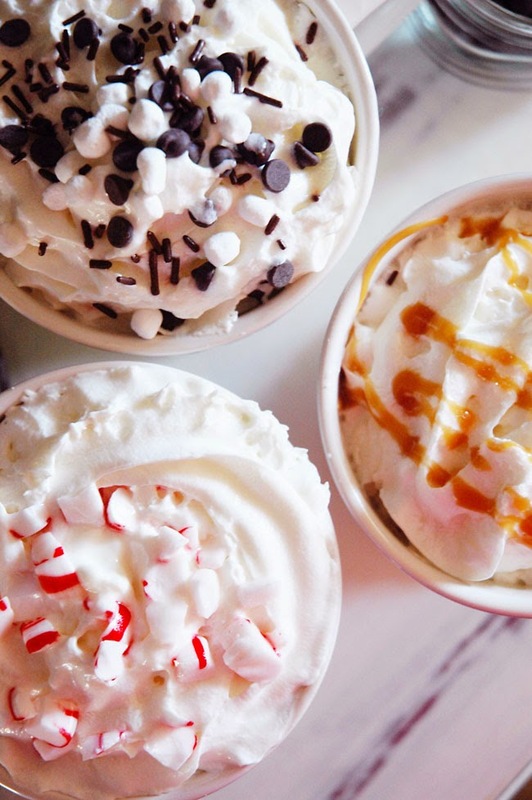 Cover with whipped cream. Drizzle on some caramel and add a tiny sprinkling of sea salt to finish. YUM!! Mix up a mug of Hot Chocolate. Add 3-5 pumps of Peppermint Syrup. Stir with a Peppermint Stir Stick if you like. Sprinkle on crushed peppermint. TASTY! Mix up a mug of Hot Chocolate. Add a spoonful (or two) of mini chocolate chips. Stir. Sprinkle mini chocolate chips and mini marshmallows on top. Finish with dark chocolate vermicelli sprinkles! DELISH! This year is the first year I've included the infamous Pepperidge Farm Pirouette Cookies as part of our Hot Cocoa Bar. The Pepperidge Farm Chocolate Hazelnut is my favorite but there's also a French Vanilla Pirouette option if you prefer! They don't take up a lot of space and fit in a jar nicely. My girls are loving them. I've mentioned in the past that I prefer the mini dehydrated marshmallows over the normal, soft mini marshmallows but I decided to make a place for both options on the bar this year. We are REALLY enjoying it - as always! It's such a fun thing to put together and because I didn't style it "Christmasy" we can keep it up for New Year's and continue to use it throughout the entire winter season! One thing I will definitely be adding next year is a to-go cup option - with a lid. I'm missing the mini Kraft Ripple to-go cups from last year and want to have the 16oz. Kraft Ripple Coffee Cup sizes available to be able to send people off with a nice, warm cup of Hot Cocoa! I hope you love how it turned out! 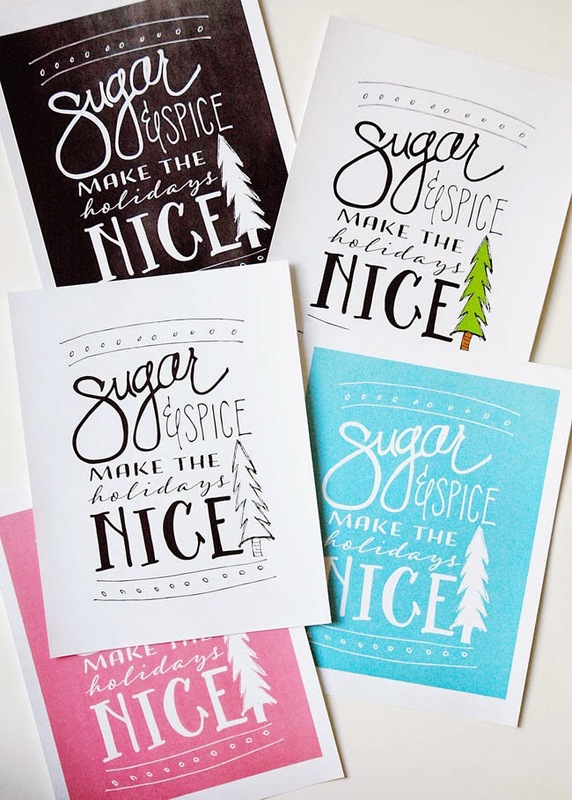 The printables are NOW AVAILABLE IN THE SHOPPE! 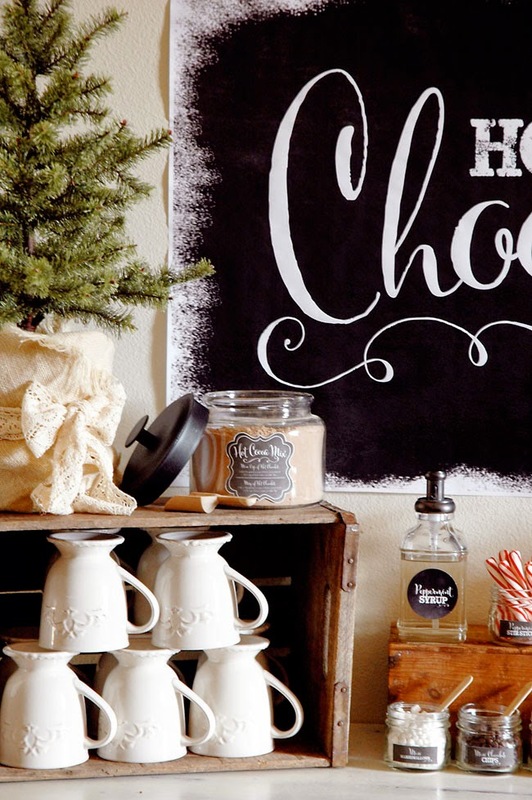 The Collection includes 4 different Chalkboard Posters and TONS of labels - including 3 different styles - round, square or rectangular. Email subscribers have been notified of the new collection and have been sent a special coupon code to save $5 OFF - must be used by midnight on Christmas Day. Aren't a subscriber yet? SIGN UP HERE to (1) receive special promotions, (2) be the first to know about new collections and art prints and (3) receive FREE printables too! Hoping you all are enjoying your holiday season! It was the last day of school for the kids today so it's officially Christmas break! I'm looking forward to it!! Those soap dispensers were actually being used in the master bathroom. So…when I snagged them for the Hot Cocoa Bar, I rinsed and re-rinsed and soaked those bottles and pumps really, really good. Would you believe the first couple of squirts of the syrup STILL had a hint of soap and bubbles in them?! So be warned! If you recycle some soap dispensers from around your own house…test them out to make sure all of the soap is REALLY out of them before offering any to your family and friends! Ha!! 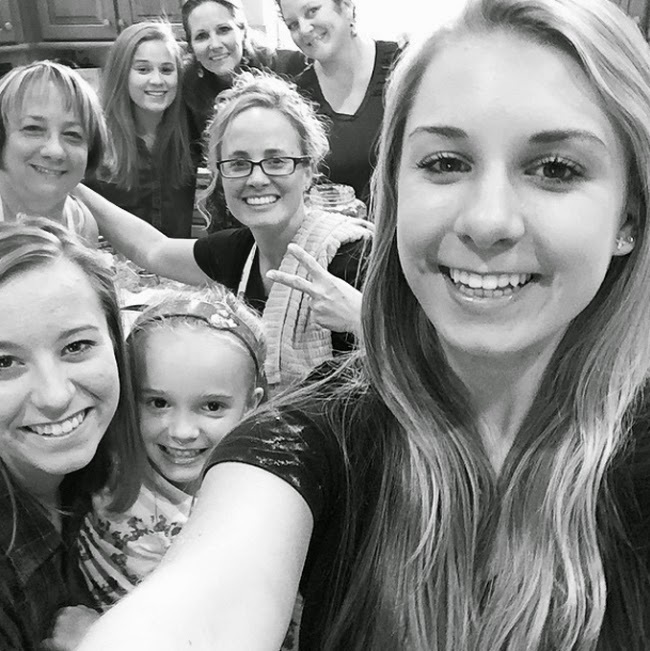 So, this past Sunday, I hosted our annual family Cookie Baking party. I spent the afternoon with my mom, daughters, aunt, and cousins covered in flour and all of us up to our eyeballs in sugar, butter and frosting. I had my happy Holiday Baking Playlist going in the background while we baked…and baked…and baked the afternoon away. Clara came up with the clever catchy name too - she's nothing short of brilliant! just in case you are looking for something a little fun and different to make for your neighbors, mail carriers, teachers, office staff, etc. Mix sugar, pecans and 1/2 tsp. cinnamon in bowl. Stir in melted butter. Set aside. Beat sugar and butter together in large bowl until light and fluffy. Add vanilla and eggs - mix until well blended. Stir in flour, cream of tartar, baking soda and salt, mixing well. In small bowl, combine 2 TBSP. of sugar + 2 tsp. cinnamon, stirring until completely blended. Shape cookie dough into 1" balls. Roll in cinnamon/sugar mixture and place on ungreased cookie sheet. Using your thumb, press down in the center of each cookie ball to create a well. Spoon in about 1 tsp. of the Streusel topping and press down lightly. Bake at 350º for 10 - 14 minutes - or until a light golden brown finish. Remove immediately from oven and cool on wire racks. These cookies are meant to be eaten when they are soft so I recommend baking and gifting them the same day for best results!! OR…you can try adding a couple of slices of bread to the airtight container or ziploc bag you are storing them in so as to maintain moisture. And here we all are!! I love the flour on Clara's sleeve with all of us crazies in the background! LOVE the selfie group shot Clara got of all of us. Thanks for the photo AND the Strueseldoodle cookie idea Clara!! And would you look at all of the cookies we made!! Clara and I had much grander plans for these cookies originally. BUT…after sampling the cookies with just the streusel we knixed the frosting idea altogether. It would've been too much. 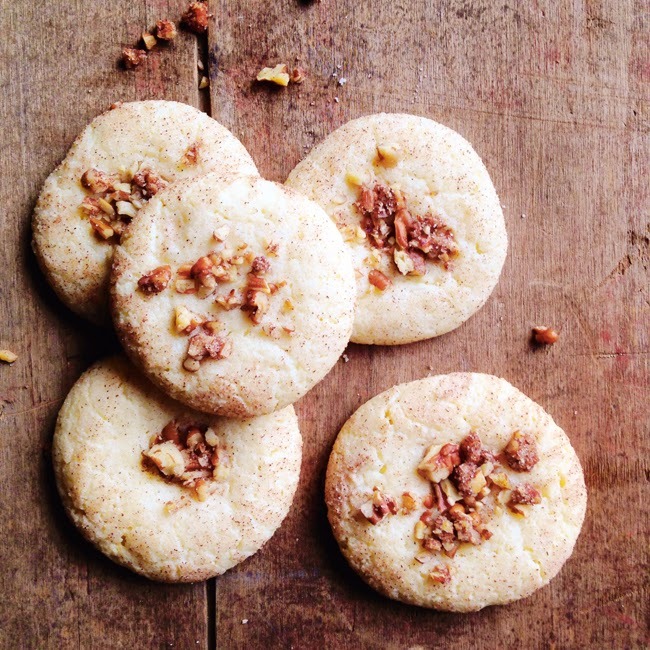 The simplicity of the snickerdoodle + streusel topping was perfect all on its own. Simple is always better. Right? Also…it HAS to be mentioned that our first batch of Snickerdoodles we attempted to make the night before were a #cookiefail - Clara We put double the amount of butter so we had Snickerdoodle pancakes - not cookies. Ha!! A very special balloon release for my cousin Holly. My whole family participated in releasing balloons together today. it felt good to be able to do something to celebrate and remember together. when it comes to things like this. This morning I attended a field trip with Ella to the same Santa's Christmas Tree Forest we go to every year to pick out our Christmas tree. We did a hayride, a bounce pillow, a petting farm and a picnic lunch while we were there and thank goodness the sun was out! The high today is only 63 and that is FREEZING for this Florida girl!! I'm back in my warm studio for just a few minutes before racing off to pick up Ema from school. 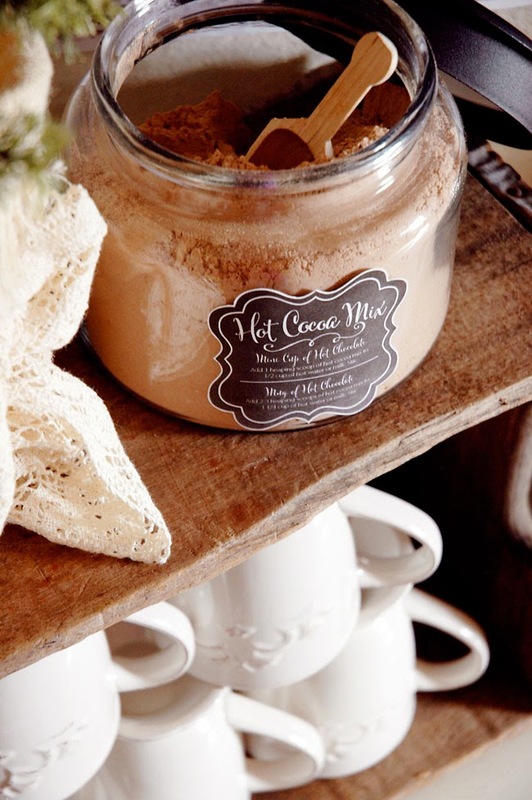 I'm desperately trying to wrap up a new version of the Hot Cocoa Bar I shared with you a few years ago - been trying to find time to put it together for over 2 weeks now. My girls and I LOVE having it up and it's quickly become one of our favorite parts of our holiday/winter decor and season!! If you love the original quote I'm sharing today you can find more every day of the week over on my Instagram feed. I'd love for you to follow along!! Still need to get the Christmas decor and tree ornaments out of the attic. 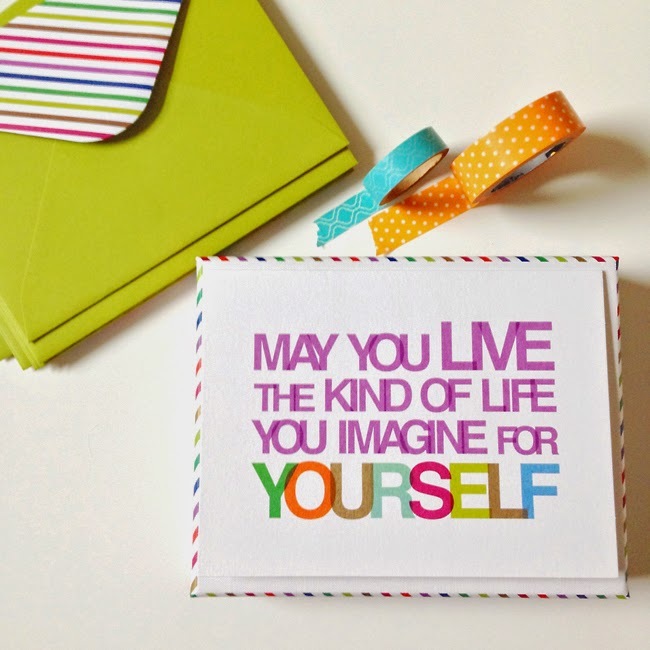 Truth be told… I've been sitting on the computer most of today trying to finalize gift ideas for my two older girls. I've been feeling overwhelmed a little by the list of things to do - which I'm surprised by because I was just thinking a couple of days ago "I don't seem to be as frantic or caught up in all of the hustle and bustle this year. My work load is much lighter than usual and I'm not overcommitted on the calendar either." And yet here I sit this morning…feeling a little "Bah Humbugish". It could totally be the rain and dreary weather outside I suppose. I mean we DO have BEAUTIFUL lights up outside this year. Yay!!! They look great, were super easy to put up and are perfect for the French Farmhouse (rustic + elegant) vibe I'm going for. Ema even helped me wrap the trunk of the tree in our front yard and string lights up some of the branches too. Our neighbors keep making comments like "You're really going all out this year…aren't you?" Ha!! That's soooo not true. They haven't seen our Christmas tree - lights only right now!! So first up...I think I'll push play on that Holiday Baking Playlist I shared with you a couple of days ago. 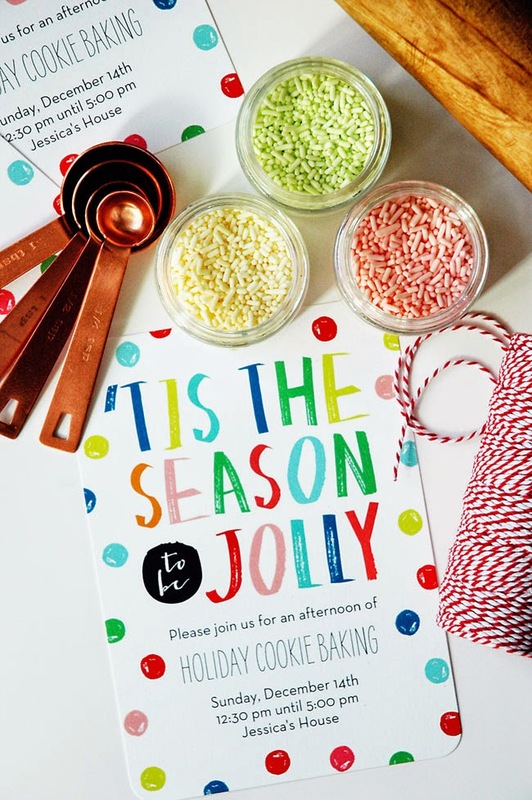 It's upbeat and happy and that's what we'll be listening to during our Holiday Cookie Baking Party on Sunday. Every time I put on my Favorite Christmas Song...I'm immediately rejuvenated. It seriously puts me in a good mood every time!! You should try it!! Ema and I haven't put lights on the outside tree together since her and I attempted it a couple of years ago. Two holidays ago, it happened to be a really cold, dreary day when we decided to take on the task when a light drizzle began in the middle of our project. Next thing I know her and I kept getting shocked because the lights were plugged in. Eeeks!!! We laughed about it this year while stringing the lights together again. And would you believe…just as we were finishing…it started sprinkling!! What are the odds of that? (we weren't electrocuted this time though). Phew!! And yes….we've got lights on our Christmas tree but the decorations are still in the attic. We may get to that tonight? I'm not sure. 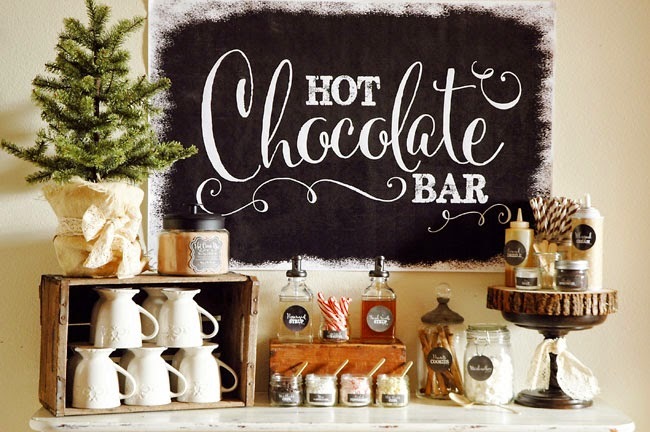 I might decide to put our Hot Cocoa Bar together instead and snuggle up with my family in front of the fire and watch my favorite Christmas Movie...Elf. I host a Holiday Cookie Baking party at my house every December with family. We come together for an afternoon of baking so that at the end of the afternoon we all have a nice assortment of holiday cookies for either eating or gifting/sharing with others. The idea was actually inspired by my grandmother's cookie press. 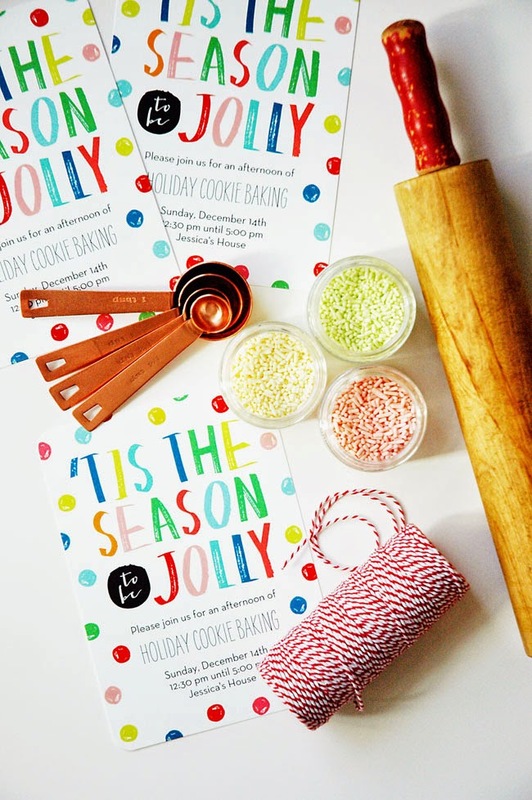 This year, I used these super cute "Jolly Dots" Shutterfly cards to send out to get everyone excited!! I just LOVE how they turned out with the bright cheerful colors and polka dots!! I got the jolly dots address labels to match too - which made sending them out a cinch!! When I was looking for the links to share with you I noticed the invitations are now 40% off and the address labels are 50% off through midnight tonight - December 4th!! Awesome!!! and we make memories…every year. I continue to learn something new for the next year that will help things go more smoothly and keep things fun and stress-free. I thought you might like to know how I do it…just in case you want to do one of your own. The first couple of years we just got together and baked and ate cookies and cookie dough all afternoon…which was totally fun. BUT…it was too much sugar and not enough sustenance. So now…I'm providing an easy lunch for everyone to help themselves to whenever they feel like eating. Last year I did a big pot of White Chicken Chili. This year I'm doing a from-scratch homemade pot of chicken vegetable soup with homemade biscuits. (I've got the biscuits in the freezer from a few weeks ago and will just pop those in the oven). I'll make the soup the day before so it only needs to be reheated in a crockpot. The idea is to make sure it's easy to eat, easy to clean-up and that it doesn't take up much kitchen counter space - leaving more room for baking cookies. Without a designated ending time, the first year we got together our "afternoon of baking" quietly transitioned into a late evening…leaving us all completely exhausted - and hungry for real food. (see "Provide a Lunch" above). By setting a time, we're a little more cognizant of staying on task and we can actually let our own families know when we'll be done. (and when the cookies will be available for eating). Ha!! Remember to give yourself time for clean-up too! 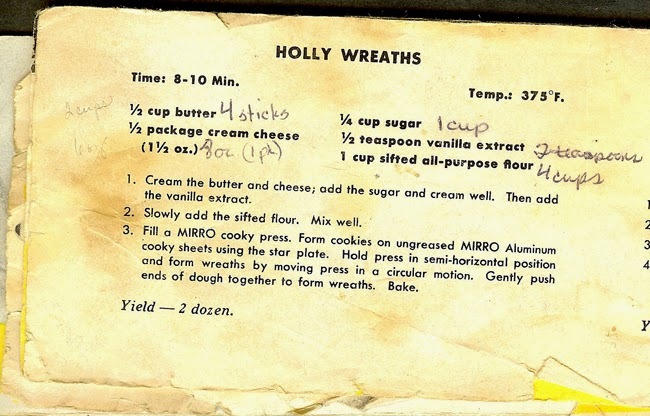 Everyone should bring the ingredients they need to be able to bake the specific cookie recipe they are looking to share. I also make sure to have plenty of the staples on hand, (flour, sugar, vanilla, salt, butter, eggs, etc. ), just in case someone forgets something or we decide to make more of something. As the hostess, I make sure to have pot holders, cookie sheets, spatulas, scrapers, measuring spoons, measuring cups, cooling racks, rolling pins, hand-mixers, a stand mixer and scoops. You might also want to have on hand wax paper and parchment paper. (I add a little something to my supply every year - like this year I bought another set of measuring spoons and I'll be buying some more pot holders and cookie sheets). I also provide extra baking staples - see "Cookie Ingredients" above and my family is lucky since I always have a well-stocked pantry filled with all sorts of sprinkles and sparkles. 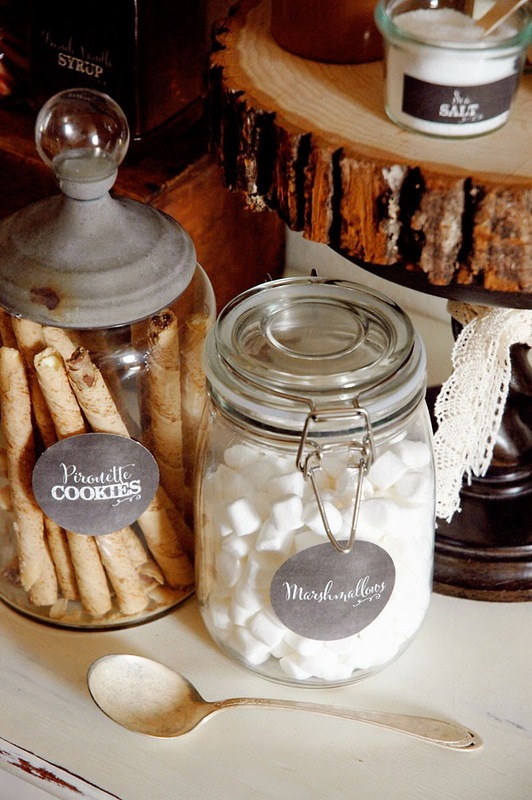 Each person that is participating in the baking should bring the ingredients for their own cookies, (see "Cookie Quantity" below), as well as some type of packaging to transport all of their cookies home. Some people will just use a paper plates and slide them into ziploc bags. Others will use basic plastic storage containers they already have in their kitchen. I usually try to have pretty packages or plates to go ahead and package up my cookies for gift giving so that my family doesn't eat them all. I picked up these darling rectangle plates from the Oh Joy! collection at Target this year. I'm trying something new this year because we are going to have more bakers in the kitchen. Since I only have one oven and a tiny side oven, I'm going to make my cookies ahead of time to free up the oven. I'm thinking that will allow me to enjoy more time with my family and help them with the recipes they are making. You know music is HUGE for me so you might have already guessed I always make sure to have some playing in the background while we are baking! Now I call it "Christmas" music because that's what I celebrate but you can call it "Holiday" music if you prefer. Whatever you call it…make sure you've got your favorites playing. (I'm even polling my guests this year to see what their favorites are so I can add them to my Spotify "Christmas Baking" playlist. 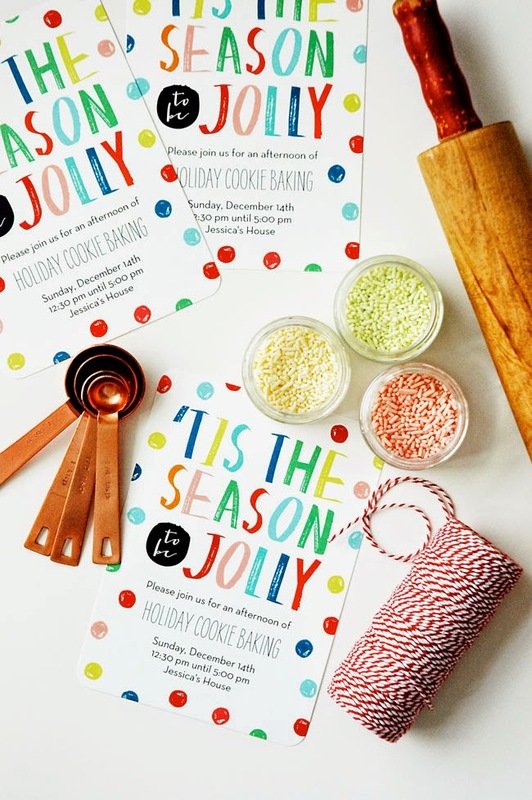 Hope these helpful tips will encourage you to host your own Cookie Baking party!! Packaging up homemade goodies for friends and neighbors. Singing along to my favorite Christmas music. and last but not least…treating my girls and J with homemade holiday cookies. and the Christmas tree lights are on the tree…as of last night. That's the extent of our holiday cheer so far. 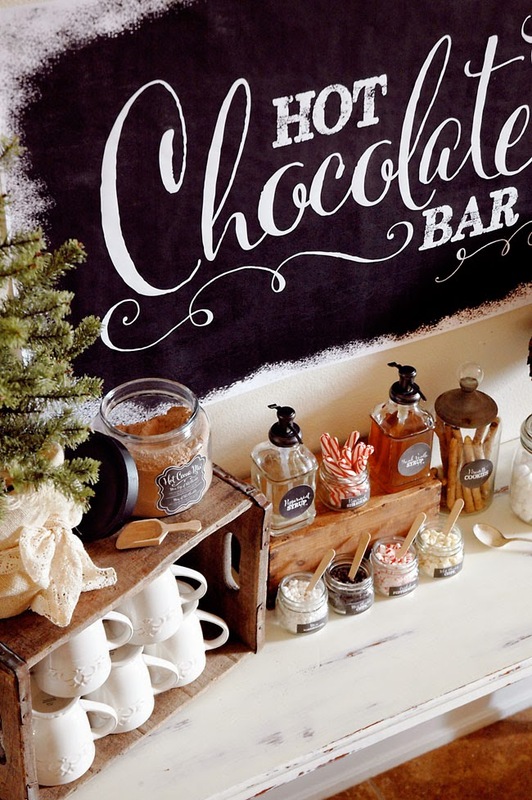 Hoping to get my Hot Cocoa bar up, the tree decorated and lights up outside before our afternoon of Cookie Baking. 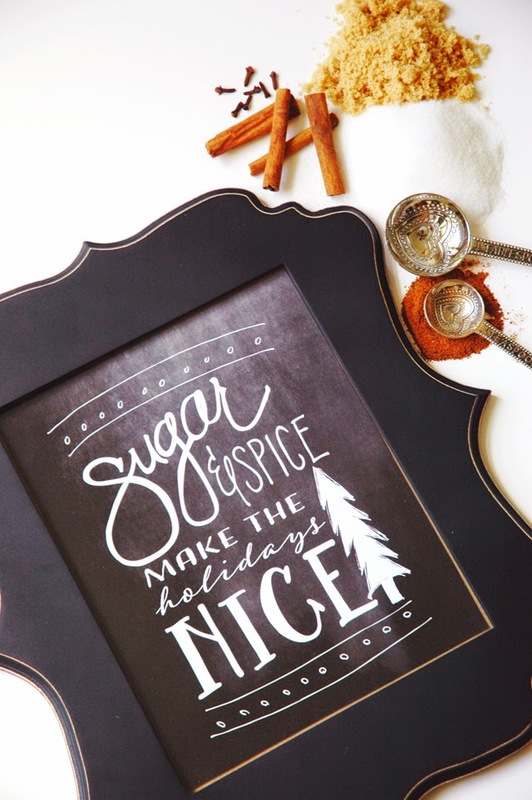 I'm so excited to share with you this month's "Sugar and Spice" 8x10 Kitchen Art Print I designed. It comes in several background options and you can download it for FREE over on The Cake Blog!! I've seen people frame the art prints OR even just attach them to the glass of a frame using cute washi tape. The washi tape option would make it super simple to swap out the prints with the new one every month!! 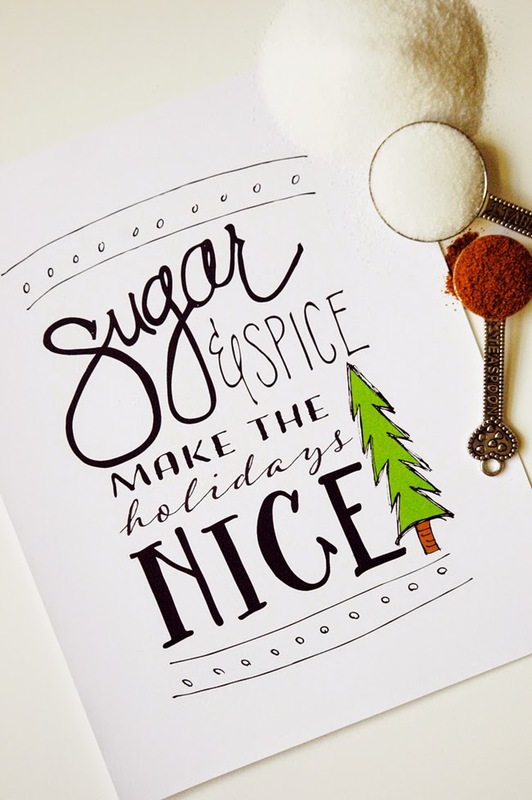 I hope you'll print this out and display it in your kitchen while you are baking away this holiday season!! 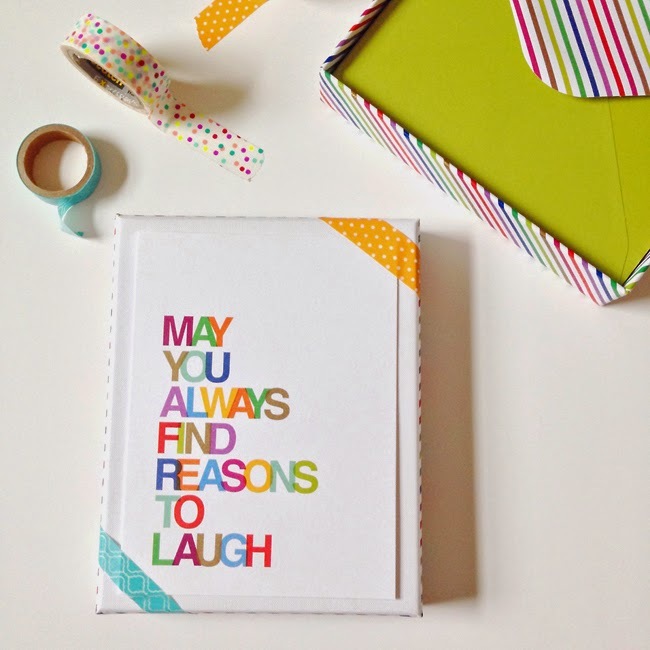 You could even print out an extra or two for hostess gifts. I NEED a new camera and a new computer - just sayin'! My camera is 10+ years old and the computer is going on 6+ years. This mama blogger needs an upgrade! !